An initial meeting takes place to discuss your garden and your requirements in detail and to view the site. 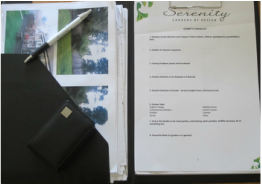 A checklist will be sent to you before the meeting which will help you think about how you want to use your garden and what you want to achieve at the end of the re-design. This will be discussed at the meeting. From here we will provide you with our design fees for the project, a written brief to be agreed and estimated timescales.